Cambodians go to the polls on Sunday amid worries over voter intimidation and violence. Reports say at least nine political activists have been killed since the start of the campaign. The Interior Ministry has denied the killings are politically motivated. This is the third election since the UN-sponsored poll in 1993, which marked an end to years of turmoil. The National Assembly, or lower house, has 123 seats with members directly elected for a five-year term. In May the National Election Committee (NEC) said 25 of Cambodia's 46 political parties had successfully registered. In early June the NEC said it had removed the Progressive Cambodia Party and the National Construction Party for failing to submit deposits and documentation. On 19 June, the Khmer Helps Khmer party quit the race citing intimidation at commune and village level. Of the 22 parties now contesting the elections, Prime Minister Hun Sen's Cambodian People's Party (CPP) is regarded as favourite after winning over 60 per cent of the vote in last year's local elections. The CPP is being challenged by Prince Norodom Ranariddh's royalist Funcinpec party, a junior partner in the outgoing coalition. The opposition Sam Rainsy Party (SRP) is the other main contender. There has been some debate in the media on whether or not Cambodia's 50,000 Buddhist monks should vote. While the head of the Buddhist clergy, Tep Vong, has urged monks to "remain neutral", a view backed by the government, head of state King Norodom Sihanouk believes they should be exercise their constitutional right. Hun Sen, who has led the CPP for the past 18 years, is running for another term as prime minister on a platform of what he describes as his "proudest achievements": stability, security, investment and tolerance. The party dominated Cambodian politics since the fall of the Khmer Rouge in 1979. With over 90 per cent of village chiefs belonging to the CPP, it has a strong power base. The United Front for an Independent, Peaceful and Cooperative Cambodia (Funcinpec) is a royalist party founded in 1981 by King Norodom Sihanouk. It too has its main support in rural areas. Now led by the king's son, Prince Norodom Ranariddh, it has been the CPP's junior partner since the 1998 elections. Sidelined by the CPP from influential government posts, the party has seen its support decline. In the 2002 local elections it gained only 21.4 per cent of the vote against 31.5 per cent in 1998. Its election pledges are similar to those of the opposition Sam Rainsy Party: fighting corruption, attracting foreign investment and improving health, education and justice. Founded in 1995 by Sam Rainsy, the SRP was originally known as the Khmer Nation Party. 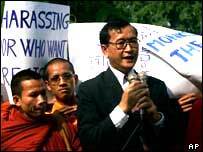 Once a senior economy minister and member of Funcinpec, Rainsy was expelled from the party in May 1995. The SRP has adopted a strong reformist agenda and has achieved considerable electoral success given its relatively short existence. The party has criticized the CPP and has promised a crackdown on corruption, tax avoidance and smuggling. Other election pledges include more pay for civil servants, an extra 104 million dollars for education and a further 70 million dollars for health. The SRP has grown in strength after internal dissent within Funcinpec resulted in defections to the SRP. All three main parties have played the "race card" by stirring up traditional hostility towards ethnic Vietnamese. Opposition media have attacked the CPP for its communist roots and for allegedly planning to cede territory to Vietnam.